Ketchikan, Alaska - When walking down Mission Street in the 1930s, you could catch a whiff of fresh bread baking at all hours of the day and night. Following your nose you'd smell coffee and cinnamon, feel warmth from the oven and bright lights through the window. You'd go in for a pastry and a "mug-up" laced with cream and sugar and served with a smile. Just think how enticing that could be on a cold winter morning, afternoon or night! 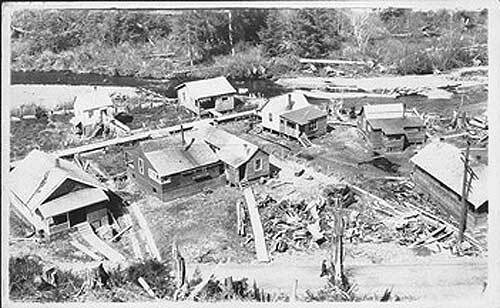 This would be in Ketchikan near the corner of Mission and Bawden next door to Sully's Planing Mill & Cabinet Shop. Here old Bill Nickey's Federal Market & Bakery put out aromas that warmed even the coldest downtown soul. Born in 1889 Nickey probably learned the baking trade while growing up in Illinois. By 1910, according to the U.S. Census, he was working as a baker in San Francisco. In 1915 at the age of 26 he married his 18-year-old sweetheart, Helen, and they made their way to Alaska. Once in Ketchikan, Nickey got a job at Mike Heneghan's OK Bakery. He and Helen rented an apartment at Charcoal Point, where the Alaska Marine Highway terminal sits now. 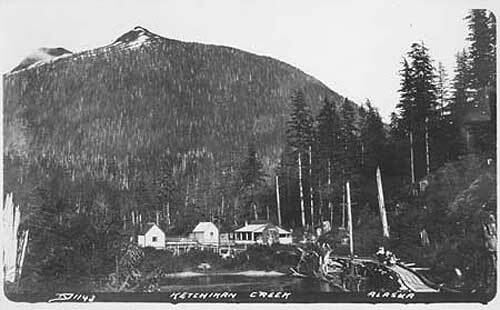 By 1917 the Nickeys had purchased their own piece of property located on Ketchikan Creek near today's Harris Street-which back then was not a street at all but a narrow wooden tramway that followed the creek to an abandoned gold mine owned by John Schoenbar. For awhile all went well. The Nickeys built a home, settled in and began purchasing additional creek-side property. Before long the area from the old tramway to the foot of Deer Mountain and Mahoney Heights (today's Woodland and Deermount Avenues) became known as "Nickeyville." In 1918 Nickey also purchased a two-story building on Stedman Street, probably with the idea of starting his own bakery. In 1919 construction began on a narrow dirt road to be called Park Avenue, which connected the Nickeys' properties to downtown, provided early automobile access to Nickeyville and made it a desirable location for new homes and families. Life was looking good for Bill and Helen Nickey. Then in 1921 disaster struck. Before Nickey knew what was happening, Helen fell in love with another man, moved out, left town, and settled in Washington State. There was nothing Nickey could do. In need of money he sold his Stedman Street property, began developing lots for sale at Nickeyville, and continued to bake bread for Heneghan's Bakery. 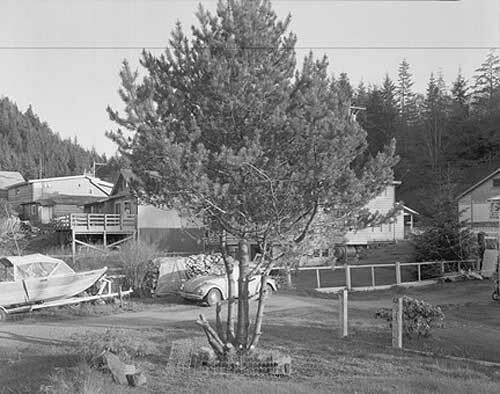 Nickey also acquired property a short distance south of town where he built a small cannery and for a time hand-packed and sold clams, crabs and shrimp. Finally in 1926 when Heneghan decided to retire, Nickey found the wherewithal to purchase the old OK Bakery equipment, as well as a piece of property near the intersection of Mission and Bawden Streets. Nickey told the Ketchikan Alaska Chronicle he'd also bought supplies from the Ketchikan Bakery, ordered a new state-of-the-art oven that would bake "360 ten cent loaves at once" and planned to operate "the most modern and up-to-date bakery in Alaska." He expanded the business by joining with (and later buying out) C. H. Hancock of the Olympic Meat Market. To start with, the combined business was known as "Olympic Market & Quality Bakery." 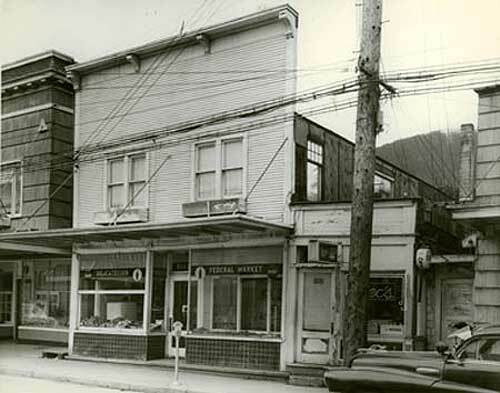 In 1931, however, when Ketchikan's new Federal Building opened across the street, Nickey changed the name to the more appropriate "Federal Market & Bakery." Over time Nickey prospered and even found himself a new wife. The year 1930 found him married to a 38-year-old Polish lady named Yetta who worked with him at the market and bakery, according to the U.S. Census. Nickey had a soft spot in his heart for old ships, which he enjoyed restoring if not to their original glory at least to a seaworthy condition. When World War II came along and put an end to the beer-brewing business, Nickey put the Meteor to work hauling scrap iron and metal from Ketchikan to Seattle. This proved a profitable business during the war. In 1946 Nickey did salvage work on the S.S. Prince George, a 3,372-ton Canadian steamship that caught fire and burned at the dock in Ketchikan. The ship had to be towed to Gravina Island, where she lay until repairs and salvage work could be completed. She was later towed south. At heart, though, Nickey was a baker and loved his bread. He became best known for the Federal Market & Bakery, with its tempting aromas and friendly atmosphere. Nickey was the perfect guy to have downtown on cold winter days and nights! He retired in the 1940s and eventually moved to Tacoma, Washington, where he died in 1969. Ketchikan Alaska Chronicle, Ketchikan, AK: July 19, 1919. Ketchikan Alaska Chronicle, Ketchikan, AK: March 3, 1926. 1910 United States Federal Census, Washington, DC: National Archives and Records Administration. 1930 United States Federal Census, Washington, DC: National Archives and Records Administration. Roppel, Patricia. Unpublished research, Ketchikan, AK: 1970. Wingren, Al. Interview by Patricia Roppel. Ketchikan, AK: 1971.